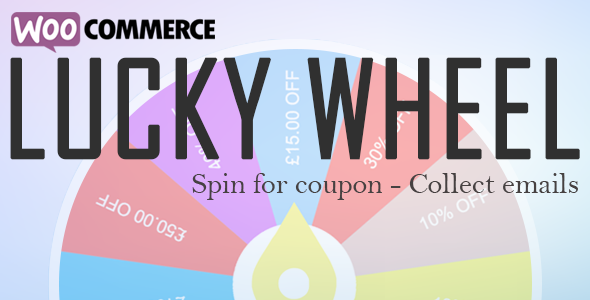 Subscribe to spin: WooCommerce Lucky Wheel allows customers subscribe their email to spin for a coupon. Send coupon email: Send coupon code to customer email after successful spin. Specify assign pages: Choose to hide the pop-up on Homepage, Cart page, Checkout page. Hide after successful spin: The wheel will be automatically hidden after successful spin. Unlimited number of pieces: You can add as many wheel pieces as you want. Winning probability: Select the winning probability for each piece. Pieces color: Select color for each piece. Auto select color: Auto select ton-sur-ton color for pieces with a chosen color. Auto-generate coupon: The plugin automatically generates winning coupon with the amount that customers have won. Email design: Customize the coupon email which will be sent to customers. Sync with MailChimp: Sync subscribes emails with a MailChimp List by using MailChimp API key.